Dr. Howington is a Thoracic Surgical Oncologist at St. Thomas Health, where he is the Chairman of Thoracic Surgery and Co-Director of the Thoracic Oncology Program. His focus is on minimally invasive treatment options for thoracic cancer and participation in promising clinical trials. 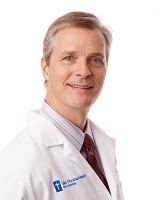 Dr. Howington received his undergraduate degree from Tennessee Technological University and his medical degree from the University of Tennessee Health Sciences Center. He completed his General surgical residency at University of Missouri, Kansas City, and his Thoracic surgery residency at Vanderbilt University Medical Center. Dr. Howington serves a number of professional societies. He is President of the Board of Trustees of the CHEST Foundation, the philanthropic arm of the American College of Chest Physicians. He served as co-chair of the Postgraduate committee of the Southern Thoracic Surgical Association in 2015 and currently serves on the work force for coding & reimbursement for the Society of Thoracic Surgeons. He is also a fellow of the American College of Surgeons and the American College of Chest Physicians. He has been consecutively recognized as one of the Best Doctors in America from 2007-2016. He was also recognized in the US News and World Report, top 1% of Physicians in the US since 2012. Clinical: Lung cancer, lung cancer screening, lung cancer in women. Personal: Exercise, cycling and mountain hikes.